Big W toys and family entertainment catalogue 16 July 2015 is one of the entertainment catalogues addressing families. I am writing this because we had had 4 different toy sale and kids entertainment catalogues from Myer, Target, Kmart and Big W. Now the retailer has got a newer product range for kids and family. It contains Disney books, DVD movies, gaming consoles, video games etc. Also see indoor home entertainment products like Full HD TV products which you may place in your living room for comfort and better experience of watching a nice movie. All together they are featured on this catalogue. Reach more of the Big W Toys and family entertainment catalogues on the category page. 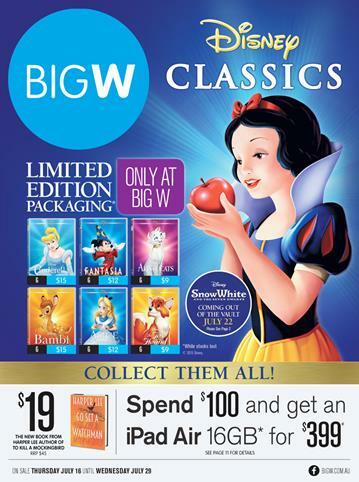 Big W July products Disney Classics on pg 2. See new books of Disney classics on the latest Big W range. The products on pg 2 are only at Big W.
DVD movies from latest Big W Catalogue family entertainment pg 2-5. Gaming consoles featuring Playstation 4, XBOX One, XBOX 360, Disney Infinity, amiibo, Skylanders Trap Team pg 6&7. Viano LED HD TV and LASER DVD Player Philips and Sony products pg 8. Meet new offers of Big W Catalogue with the smart phones, Nikon DSLR Camera and even more products pg 9. Samsung and Apple's Tablet PC varieties on pg 10-11. Nikon Coolpix digital camera and printer deals pg 12-13. FILA active wear offers, fitness supplies and very good prices for exercising products pg 16&17. Dunlop sports products, fitness supplies, active wear for ladies and plates gym ball. Bikes of Repco and Diamondback on pg 20. Huggies jumbo nappies and more baby care products pg 21. Chocolate deals, coffee variety, Coke and confectionery pg 22&23. Big W Catalogue Home Products July 9 - July 22 2015 prices have been released and you can see full catalogue of home products on the preview page now. With these catalogue the products you can see are generally bedroom products, kitchen ware, kitchen appliances, cookware, popular electronics, chemical cleaning products, beauty products, chocolate and confectionery products and even more offers. It is possible for you to complete essentials or comfort of any part of your house with this Big W Catalogue released in the second week of July 2015. Bathroom towels, cushions, bedding products are featured on the first section. Catalogue prices are valid until 22 July 2015. The products like pillows which are only at Big W can be seen on pg 6. Seasonal bedroom products which are essentials of any bedroom are featured on pg 6-7. Decorative living room accessories, storage products and laundry baskets on pg 7. Kitchen electrical appliances, dinner sets in classic and modern design on pg 8-9. Cook pots, cooksets and utensils and 25% off on pg 10-11. Breville microwave oven, Piranha vacuum cleaner and frypans on pg 12. Heated throws, heaters for winter on pg 13. This is the largest range for the products of Minions I have seen so far. In the Big W Catalogue Toy Sale July 2015 you can find the many of the Minions toys and products with theme of Minions. An incredible toy range is available on the Big W Minions Toys. Game sale is also another popular range of Big W Catalogue of this week. It is popular at all three toy sale catalogues like Kmart, Target and Myer. Game consoles are probably the most visited and most preferred entertainment section of these catalogues. Online product sale of Big W both is available on their official site and preview is available on our page but you can shop online only on the official page. See pg; 2-8 and check out various Minions products including Despicable Me DVDs. Check out the list below for the toys and products. There are more than toys and accessories or DVDs. Some furniture and school products of Minions are also featured on Big W Catalogue toy sale ! Check out latest prices for XBOX, Wii U, Playstation 4 and video games. Video games for XBOX on pg 130 - 131. New Big W Catalogue was updated ! We are in the time period of toy sale of the all toy retailers like Target, Kmart, Big W, Kmart release the special toy prices. 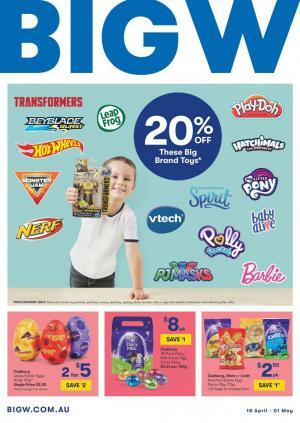 This week Big W Toy Sale Catalogue 25 Jun 2015 is one of the toy catalogues which we can browse on the catalogue pages. They have got 132 of toys consisting of greatest brands, Disney toys, Fisher-Price, game consoles, other entertainment products for preschool, boys, girls. Moreover apparels of kids for new season, movies, video games, figurines, and special products of minions from the movie "Despicable Me". Check out first section of Big W Toy Sale Catalogue 25 Jun to see them. Sound systems and Philips NTRX700 PG; 120-121. Are among what you can purchase from the section of electronics. Great family movies, cartoon movies and new release feature movies are available on pg; 124-127. Check out pg; 127 and later pages for the game consoles and video games from the selection of latest release. Are some of the products from Big W Catalogue game sale published in 25 June 2015. Please go to Big W Toy Sale Catalogue 25 Jun 2015. Big W Catalogue big sale of essentials like underwear, sleepwear, nursery products, travel and sports products, confectionery, chocolates, office supplies, etc. Some entertainment products like books, Disney favourites are featured on Big W Catalogue as well. Big W offers 50% off family winter clothing, 50% off family winter footwear, pods, bags. In Big W catalogue big sale pages you can find underwear products. Pg; 2 with the latest prices of underwear set for kids, bras, Emerson underwear, Hestia underwear are available. See the selection of entire product range on pg; 2. Big W lowest prices for the underwear brands for kids and adults pg; 2. Nursery items featuring booster seat, bottles, bowls and bibs pg 4. Bikes, helmets, fishing gear and some outdoor products are sold at pg; 5. Stationery products, party boxes, and more hot buys of this aisle pg, 8. Hp printer, Epson printer multfunctional are sale on pg, 9. Latest technology headphones, speakers and Boost nero smartphone priced at $24.50 pg, 11. Disney titles with 25% off and DVDs, Blu-Rays pg; 12.